Since Green Power became a standard feature of Zigbee 3.0, can we now expect Green Power sensors everywhere? Indeed, the Green Power specification enables extremely low-power and low-cost coin cell-based sensors, because it offloads all the complexity related to meshing. But where did the meshing go? Don’t we need it anymore? And by the way, just when it becomes possible to build an “unmeshed” Zigbee network, Wi-Fi “meshing” seems to be gaining popularity in the market. So what is going on? Let’s give this a closer look. Meshing has always been an intriguing concept in networking technology. It implies an alignment with the concepts of sharing and helping – values usually highly rated in the world of technology pioneers. So, it’s no surprise that meshing networking usually attracts serious attention and consideration among technologists. Its positive qualities are usually described as “self-managing, self-configuring and self-healing.” Who wouldn’t want that? In fact, on the heels of Zigbee and Thread meshing news, Bluetooth SIG recently announced the development of meshing products. Interestingly, and despite all the meshing chatter, Zigbee and Thread meshing have not been used extensively – most successful Zigbee applications in the market today do not require meshing. And although Wi-Fi also supports and has even standardized meshing (under IEEE 802.11s), it is hardly used. But let’s take a closer look at Wi-Fi meshing. The basic home Wi-Fi setup today is a cable or DSL router that wirelessly connects with our tablets and smart phones. If it doesn’t work so well, we install a repeater as an intermediate. These days there are sets of router boxes available that are preconfigured to wirelessly work together to cover our sprawling mansions or tidy cottages, as the case may be, including that room behind the garage where we escape to play video games. Reliable, speedy coverage. So how can meshing help? The concept is a simple one. If I am in one corner of the house with my smartphone, and a laptop is closer to me than the router, then I just hop (mesh) via the laptop – as long as it is powered on. Meshing is generally self-configuring: everyone on the network helps everyone else to reach the router and via the router, the internet. And if that intermediate laptop is turned off, then my smartphone finds another device. Meshing can also be self-healing; it’s no problem if one link to the router breaks down, as the network will (hopefully) find another one. So what’s the downside? This is one of those situations where sympathetic, pioneering technology clashes with the day-to-day grumpy consumer, who wants reliable connectivity all the time without being bothered with elegant technology solutions for intermittent network failures. It’s the difference between a good network with no problems and a not-so-good network that maybe can solve its own problems. 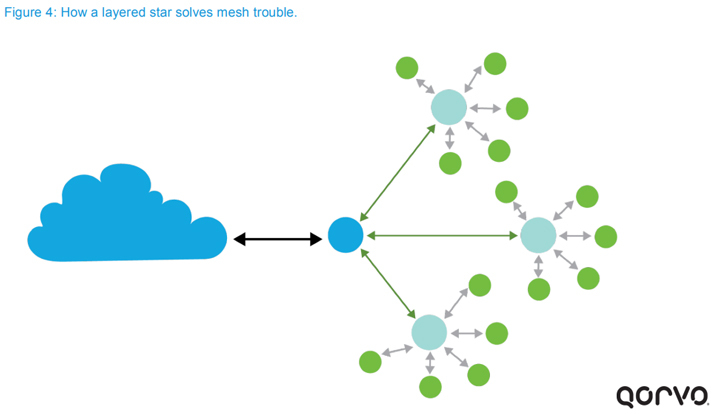 Whether it is Wi-Fi or Zigbee (or Thread), there are three general problems with meshing. The first is intermittent failures, the second is related to battery life, and the third is cost. Let’s go through each and see how Green Power solves it for Zigbee 3.0. Intermittent failures are usually recognized as a nasty type of problem – sometimes it works, sometimes it doesn’t. Nobody understands why, exactly, so nobody can really fix it. In the meshed Wi-Fi example above, maybe your smartphone network connection depends on whether your son leaves his game station on or off – and good luck figuring out that one. And then there’s battery life. In a meshed Wi-Fi network, your laptop might become an intermediate node. Suddenly, your laptop is running low on battery, because someone else in the family was (perhaps unknowingly) using your laptop as a hopping point (“meshing node”) for watching YouTube videos on his tablet. The meshing network has actually created a battery issue for a device that wouldn’t have had a problem otherwise. And finally, there’s a cost issue. Every node in the network is not only an edge node (“a node doing something”), but it also needs to be able to function as a meshing node – and it needs to be equipped to do so. In practice this means running more software on a larger processor with more memory. And meshing nodes may also have to be “on” constantly, which requires a larger and more expensive battery, while an edge node only has to be turned on when triggered. So while meshing sounds great, its costs include the loss of reliable, predictable connectivity and a higher price tag. But here is where the Zigbee 3.0 with Green Power saves the day. Zigbee enables meshing, but does not require it. Edge nodes can easily be Green Power networked, and if the area to be covered exceeds the range of a single router, multiple routers can work together to establish a backbone network that all the edge nodes can connect to, without carrying the overhead themselves to be meshing nodes. This leads to another point. In the context of a home, meshing is a band-aid solution for a poor radio that lacks range. Meshing would not be necessary with a powerful enough radio, running on a coin cell battery, that enables you to reach the router – even if it is not located in the most optimal center of the home. These radios may not have existed 10 years ago, but they exist today. This makes meshing a fringe solution for exceptional radio coverage problems. And these days, multiple radio frequency Wi-Fi channels are more often implemented, not meshing. Zigbee can do that, too. The self-healing “benefit” of meshing is also a bit of a relic from the days when networking equipment was not as reliable as it is today. Single points of failures were red flags, and mesh networks with multiple paths were seen as a great plus – enabling rerouting via alternative connections at the moment of breakdown. But with today’s reliable networking equipment, the need for avoiding single points of failures is more or less gone. As a standard feature of Zigbee 3.0, Green Power’s simple networking protocol essentially brings all the complex networking features to a proxy (usually the router), while the Green Power node focuses on making sure that the essential signal – whether a temperature measurement, a command to turn on a light, reporting whether a door or window is open or closed—reliably reaches a router for further consumption. As mentioned, Zigbee Green Power features ultra-long battery life – and in the case of energy-generating light switches, there is no need for batteries at all. Zigbee Green Power is fully integrated with Zigbee 3.0 and fully compatible with all the services that the Zigbee 3.0 delivers, from installation to security, and from ease-of-use to maintenance. What are the advantages of using Zigbee with Green Power? First, it enables simple, low-cost implementations of standard, standalone solutions. This covers most of the Zigbee applications in the market today. For example, if you have a few lamps, a dimmer-switch and a gateway, then to connect the lamps to the internet, you only need Green Power. As simple as that – no meshing capability required. For more extensive solutions, Green Power enables the building of a simple Zigbee star network in your home. Or there can be multiple stars dropping from a single backbone, in the case of a larger building installation. Either way, Green Power eliminates the disadvantages of meshing – intermittent connections that are difficult to diagnose, and unexpected situations where sensor nodes suddenly and quickly run out of battery power. Green Power also allows for a Zigbee infrastructure that is fully aligned with the Wi-Fi infrastructure in a building. It is useful to note that a Zigbee radio has a comparable or better range than a Wi-Fi radio. Zigbee (IEEE 802.15.4) is essentially low-power Wi-Fi (IEEE 802.11), although that is routinely denied by even the largest companies for what are surely political reasons. The practical fact is that both Zigbee 3.0 (with Green Power) and Wi-Fi integrate in a single router box, simplifying and cost-reducing the overall networking infrastructure for consumers or enterprise customers, and paving the way for the real Smart Home as part of the Internet of Things. But only Zigbee 3.0 networks use meshing when it really adds value – the real power of Green Power. Given all of that, what do we now know about Wi-Fi meshing? That it is not meshing at all. And for that exact reason, there is a new term emerging – “Distributed Wi-Fi.” This is indeed a more precise description of the situation. 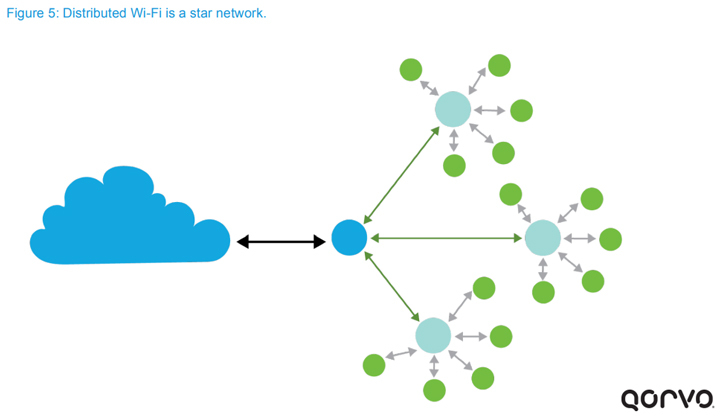 Distributed Wi-Fi is a star network. It consists of a few (3 or 4) preconfigured routers (access points) in one box. One of these, the main router, supports the connectivity with the internet; the others use one Wi-Fi-channel to connect to the main router and another Wi-Fi channel to service the devices in close proximity. If a device moves from one service area to another service area, the “hand-off” happens seamlessly. Remember, the point of all of this is to have better coverage in the home – on all floors, from attic to basement, out on the patio, in the garage, etc. – and to maximize performance by using as many channels as possible. And here’s something that makes it all even more interesting. The network structure of Distributed Wi-Fi forms a perfect “backbone” for Zigbee Green Power, essentially overlaying Figures 4 and 5. In other words, when every router also supports Zigbee (or Thread), there is truly no need for any meshing of Zigbee, Thread or (in the future) Bluetooth. How ironic! Wi-Fi Mesh made the need for other meshing technologies go away, without even being a real mesh itself. In conclusion, it seems clear that the standardization of home network architecture is still in development. But it is good to remember that consumers are probably not particularly interested in technology, and they are even less interested in technology architecture. Consumers are looking for simple products that work, that can be installed easily and that function as promised. A wireless network that is easy to install and works “out-of-the-box” is key. Ultimately, whether it is actually meshing, or just called meshing, will only be of interest to networking enthusiasts.